Vicki Bellino is the designer and owner of Bloom Creek, a company that began in 2006. Vicki lives in far northern California with her husband (and high school sweetheart) of 43 years. They have a son and a daughter and 4 beautiful granddaughters. When she isn't quilting or running her business, they like to make time for traveling and enjoy taking their RV on trips along the Oregon coast. Vicki has been quilting for 30 years. She began a machine quilting business in 2002 and quilts most of her quilts (when time permits!) to this day. She began to dabble in quilt pattern design in 2005 and was given the opportunity to design a few charm square patterns for her local quilt shop. This ultimately led to starting a pattern design company, Bloom Creek. Through her passion for quilting and wanting to expand her techniques, Vicki was introduced to English paper piecing several years ago and became instantly hooked! This eventually led to publishing 2 English paper piecing books through Martingale and another with Connecting Threads. She has had the opportunity to incorporate EPP into several of her block-of-the-month designs for Marcus Fabrics, as well as numerous patterns and kits. The world of quilting has not only afforded Vicki the opportunity for a successful business doing something she is passionate about, but has led to life-long friendships that she will treasure forever! 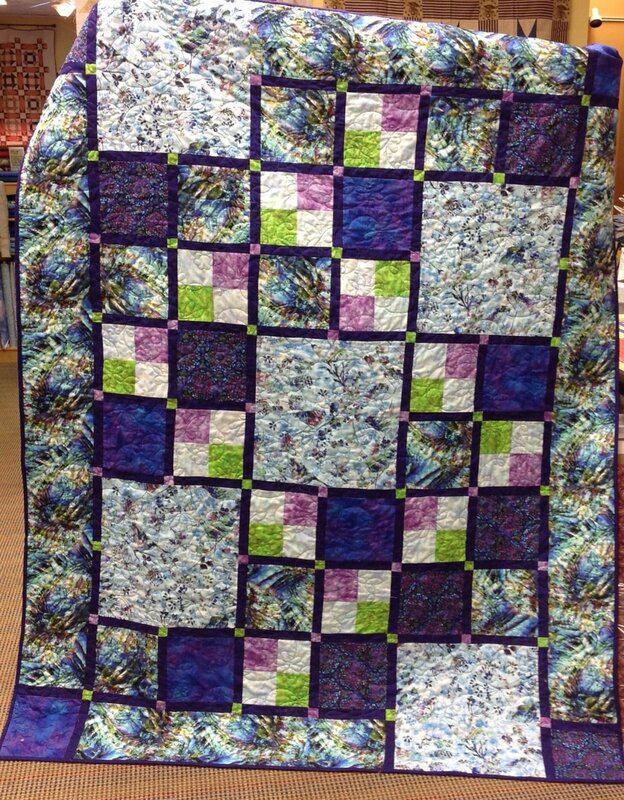 Our Shop Hop 2015 sample- blues, turquoise, green violet- Large squares to show off fabric to small to smaller 63" x 79"